“Star Wars: The Last Jedi” was released at Centennial Theatres on Thursday, Dec. 14, 2017. The premiere started at 7:00 p.m. and ran until approximately 9:50 p.m. and was received with an enormous crowd of spectators; nearly every seat in the theater was occupied. “The Last Jedi” is the second installment of the first trilogy under Disney’s direction; the first in the trilogy being “Star Wars: The Force Awakens,” was released in Dec. 2017. Director Rian Johnson was able to make this eighth episode of Star Wars a work of art containing some of the most impressive shots of this year. 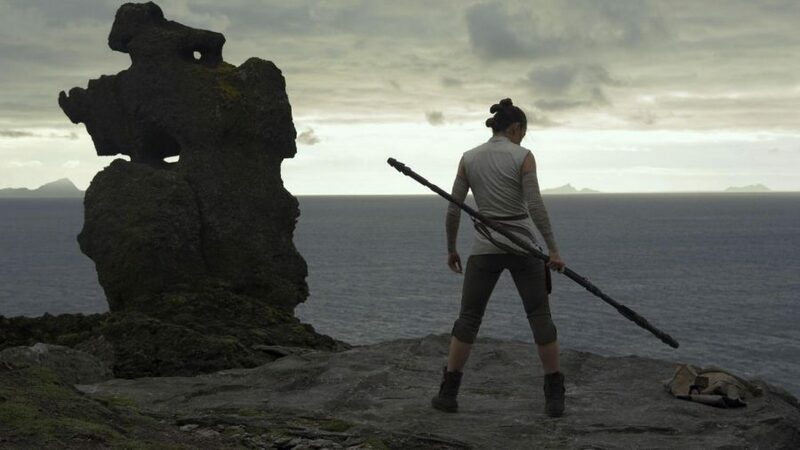 For the majority of the film, there were two story-lines: one followed Rey and her adventures on the island with Jedi Master Luke Skywalker and the other followed the Resistance, a group of rebels continuously fighting the First Order. Johnson paralleled “Star Wars: The Empire Strikes Back” with Rey’s story-line. The way that she flies to a remote part of the galaxy to find a Jedi Master is identical to Episode V where Luke flies to Dagobah to train under Jedi Master Yoda. It was disappointing, however, that the story-line following Finn and Rose of the Resistance was completely pointless. Not only was their story-line unnecessary, but the sole conflict within the Resistance could have been easily avoidable; it was yet another useless part of the plot. These unnecessary parts of the movie were a huge let down for the film. There are many instances where episode VIII ties into some of the other installments into the Star Wars saga. For example, one of the many battle scenes in “The Last Jedi” is so similar to the scene in “Star Wars: The Return of the Jedi,” that it is almost impossible not to see the reference. It was enjoyable to see that connection as a new take on a classic part of a previous Star Wars movie. Many more instances, not quite as noticeable as an entire scene, also directly point to previous movies in the saga. For instance, close to the end of the film, a young slave boy is seen reaching his hand out to grab a broom and it gently falls into his palm without him touching the tool. This is a direct reference to force-sensitive Anakin Skywalker when he was a slave as a child on Tatooine. Yet another small reference to older movies in the saga is a scene when two suns are seen above the island where Luke is residing. This points straight to “Star Wars: A New Hope,” when Luke is seen watching the binary sunset on Tatooine. While it may seem that the amount of references to other movies in the saga is extremely frequent, it must be said that all of them in “Star Wars: The Last Jedi” was so artfully done; many of them small and easy to miss. A few were large and almost in the viewer’s face. It is this combination of small and large ties to the rest of the series that makes Episode VIII such a masterful work of art. There will always be those who disagree, and to each their own, but the latest Star Wars movie was extremely well-done. The combination of special effects and emotion in “The Last Jedi” were also something else. The writers were able to mix action, tension, comedy, and many more emotions in such a way that they truly made the latest Star Wars movie unique in its own way. At times it felt like it was completely separate from the rest of the films on an emotional level and other times it felt like it was perfectly in line. The emotion that the writers were able to create mixed so well with how perfect nearly all of the shots were. The cameramen were able to capture such amazing scenes and the special effects team were able to mix those scenes with fixations that were obviously computer graphic images (CGI). The animations were done in such a way that it was unnoticeable; the viewer can feel like every scene was shot with live-action. On every level, “Star Wars: The Last Jedi” was a success. From the little, itty-bitty references to the rest of the saga, to the humor as well as the fear, it was extremely well made. Disney hit a slam-dunk as well as raised the bar for future Star Wars movies.